We get it. As a Real Estate Developer performing project management on multiple deals, across multiple stages can be full time job. Between hunting down project emails, using calendars and excel to manage project tasks, holding weekly conference calls with lenders, consultants and your internal team project management is quickly cutting into to actual project execution. Procorem is the first collaborative portal built from the ground up with the real estate and construction industry in mind. 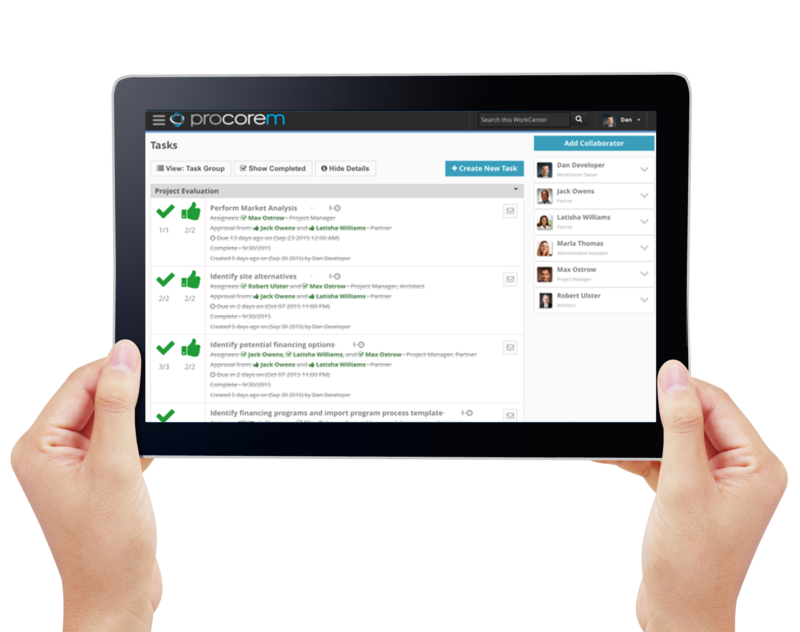 With Procorem, all your deal documents, tasks and communication is tracked and audited in a single location. Accessible in the field or at the office Procorem real estate development software is your full time project manager. Procorem real estate development software allows you to store, share, and collaborate on all your development deals in a secure, digital location. Everything’s in one place so information is easily accessible to both internal and external parties. Create a secure portal for sharing operating budgets, financial reports, streamline contractor communications, manage application submission and control the flow of information for all your projects. All activity is audited and recorded to create a living project history. Whether on-site, in front of potential investors, at the office, or working from home, all your project information is at your fingertips. Procorem real estate development software is completely mobile and can be accessed from your phone, tablet or computer without the need for downloading separate apps. With Procorem, easily manage all the complexity of your development project. Assign tasks to multiple parties, manage document and project approvals, organize your development project in specific stages and notify all parties when tasks are coming up, past due or are ready to be worked on! Procorem immediately made a difference in how I was able to manage my business. In one location, I can share sensitive financial data with partners and the board of directors, communication about important decisions under consideration, and store data that I can later access and work on while on the go. With Procorem, I'm able to do more than ever with less effort.